It was hard to miss the fact that this past weekend was Memorial Day Weekend. Stores have special sales…the kids have a three day weekend…families go camping…and it is traditionally the first day the pool opens. We often call the Memorial Day Weekend the unofficial start of summer. Let me be the first to say that traditions are important. Pam and I have both written about this before and it bears repeating. Throughout the year, our family has several things that we do to help us remember – we call these things traditions. We have traditions at Christmas (like Shepherd’s Pie on Christmas Eve). Christmas morning I make our traditional breakfast scrambles with sausage gravy and biscuits. At Thanksgiving, I am in charge of making the Potato Filling. We have a family Advent/Christmas Nativity. These are just some of the traditions that our family celebrates. For several years now, we have watched the National Memorial Day Concert on PBS as part of our Memorial Day commemoration. Last year, Pam and I attended the Staunton Memorial Day Service for the first time. This year we made everyone attend. At least this year, James was off of school. It was a beautiful reminder of those who have sacrificed their lives for our freedom. We even got on television. The local NBC affiliate did a feature piece on a trend that they noticed. That trend is that those attending these services are getting older. The question is “Where are the young people?” Both Pam and I were interviewed, although the footage didn’t make the final story, although several shots of our family did. The reporter asked why we came out? We said that this was something important to us. We want our children to remember that men and women throughout the history of our nation have laid down their lives for our freedom. It is important to remember this, especially these days. War is not a popular topic these days, but there are times when (as a country) we are left with no other option. Several years ago, I preached a sermon on the importance of remembering. The text for that sermon came from Joshua and the crossing of the Jordan. After the Israelites had crossed the Jordan, they were instructed to gather stones and stand them in the river. I’ve learned recently that this was an ancient way of recording a testimony or an event and they called these stones, standing stones. 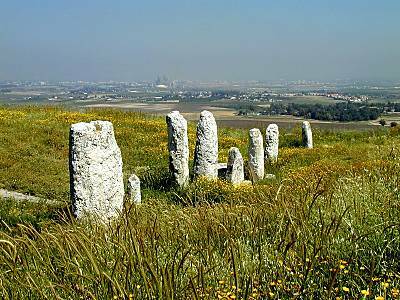 The picture above are standing stones that are on Tell Gezer. The stones in the river served as a reminder to future generations of how God moved in a powerful way at that time in their history. That is why Memorial Day is so important to Pam and me. Memorial Day serves as a standing stone – to remember those who gave their lives – that freedom isn’t free – that freedom always comes with a price – that we need to tell the story to future generations. Today, we set aside our normal routine to remember those who fought and died for our freedom. Wow, it seems as this past week has flown by. It has been a busy week as we get ready for a wedding this coming week. It’s sort of funny…in a weird sort of way…the groom is Canadian. Last year every time he visited us during the summer we had sweltering temps. Guess what? This week is going to be very summer-like. Last week, we thought we might have to get an ark. This week, I’m concerned I might have to start watering the grass, which has been growing like crazy. Looks like the typical summertime humidity has returned to the Shenandoah Valley. I have more to say about this week, but I’ll put that in a separate post on Tuesday. Since I wrote on hamy ving blogger’s block on Thursday, I’ve come up with a few ideas and Pam has fed me a few ideas for this coming week. We’ll see if I have time to work on those. This week I just may do what I’ve been doing. I haven’t written much about my running, but that is going very well. It looks by Tuesday, which is the end of the month, I will have cleared 100 miles of walking and running. Over 60% of that is running miles. I have also been trying to watch what I eat, but that is so difficult – I love food. I have hit a new milestone in that I now weigh 230 pounds. I can’t even tell you how long it’s been since I weighed that – at least 15 years. It feels so good. Last night, Pam and I prayed for the Holy Spirit’s anointing on the service this morning. Wow! This morning was incredible. The team was on and God filled the sanctuary of Parkway. It is always amazing to be used of God in ways like that. Thank you team for being obedient to the Spirit. Thank you Lord for the way you moved among our midst. I encourage you to spend some time tomorrow remembering those who gave their lives for their country. As I write this, I am listening to the National Memorial Day Concert on PBS. Tomorrow morning, we are planning on attending the Memorial Day service at Gypsy Hill Park. Last year’s service was inspirational, so we are looking forward to this years. 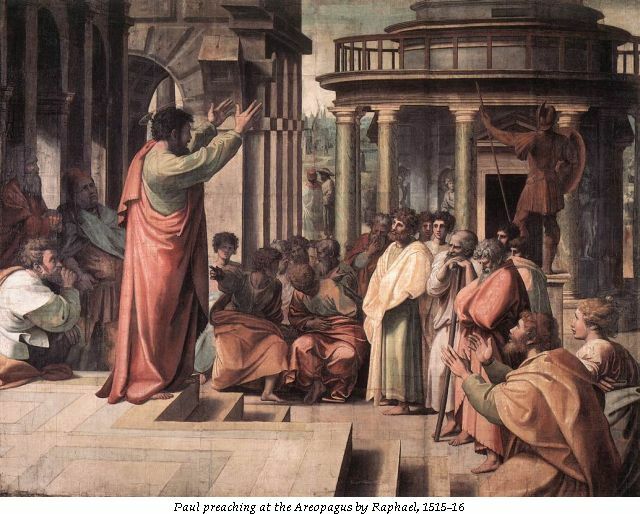 22 So Paul, standing before the council,[a] addressed them as follows: “Men of Athens, I notice that you are very religious in every way, 23 for as I was walking along I saw your many shrines. And one of your altars had this inscription on it: ‘To an Unknown God.’ This God, whom you worship without knowing, is the one I’m telling you about. 24 “He is the God who made the world and everything in it. Since he is Lord of heaven and earth, he doesn’t live in man-made temples, 25 and human hands can’t serve his needs—for he has no needs. He himself gives life and breath to everything, and he satisfies every need.26 From one man[b] he created all the nations throughout the whole earth. He decided beforehand when they should rise and fall, and he determined their boundaries. I mean to write this yesterday, but never really got around to doing it. But that is the way things have been going with this blog of late. It seems (just as many of my friends have experienced) that blogging gets pushed to the back. It is the last thing that gets done. Part of that is because we don’t have a full time internet connection at home which is typically where I do my best writing. I haven’t given up on blogging and I haven’t given up on trying to do some decent writing. Hopefully, I’ll be inspired soon – So thanks for hanging in there. I know many of you read this blog from Facebook. I’m hoping to bring it back up to speed in the near future. Blessings…. The early church was a thankful church. The instinct was to give thanks for all things and in all places and at all times…The early church was a thankful church because its members were still dazzled with the wonder that God’s love had stooped to save them; and it was a thankful church because its members had such a consciousness that they were in the hands of God.